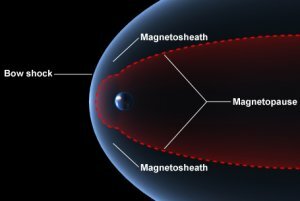 The magnetosheath is the region between a planet's magnetopause and the bow shock caused by the solar wind. Within the magnetosheath, the magnetic field is turbulent, distorted, weaker than the magnetospheric field, and deflected from an orientation in the outer magnetosheath, which is similar to that of the interplanetary magnetic field, to a draped orientation near the magnetopause. The particles in the magnetosheath come from the shocked solar wind and have a density that typically decreases from the bow shock to the magnetopause but always remains higher than the magnetospheric plasma density. The Sun's magnetosheath is known as the heliosheath.